I picked this place at random as I walked in the old city one lunch time, mostly because the façade is very different and caught my eye. I then read their mission statement on the big menu board outside and was even more intrigued: they aim to be different but good. 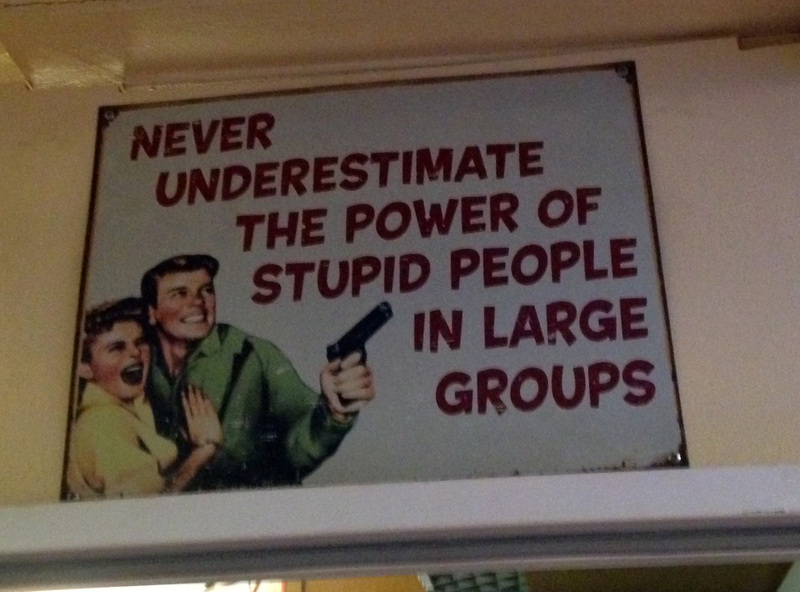 Well, I’d say they certainly succeed. As they say, “We admit that our vision of fun is slightly different to the general ‘politically correct’ way of ‘normal’ behavior and lifestyle. But that’s it, this is us! For more than 15 years it has been like that. Why change now?” Some of their framed posters certainly aren’t politically correct, but are humorous and bring a smile to everyone’s face. 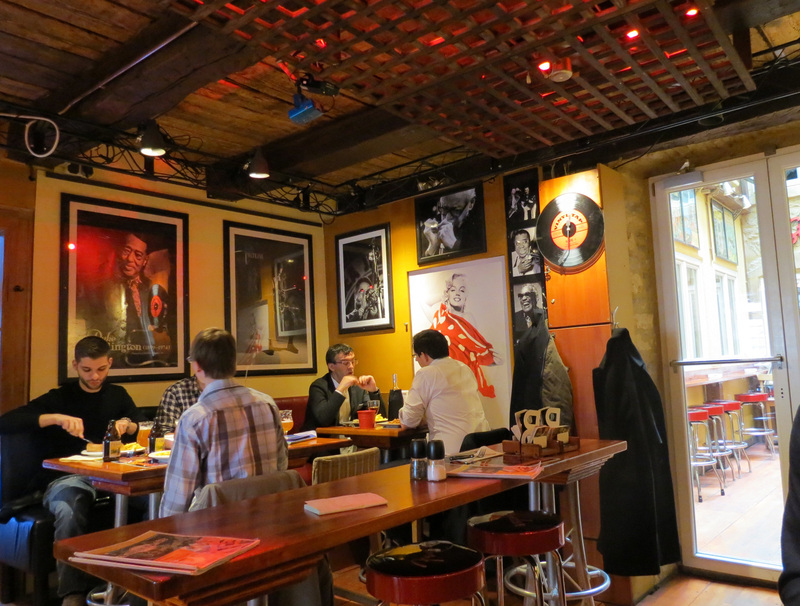 And it turned out to be another really good eating place in Luxembourg City. 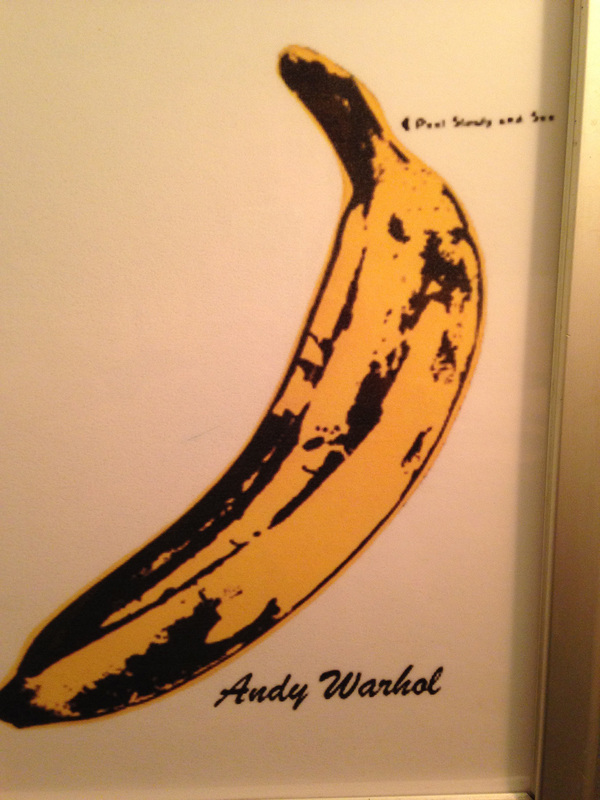 Downstairs in the basement I saw an Andy Warhol poster of a banana, and wondered if that influenced the name, and/or if it’s linked to the saying “go bananas”. 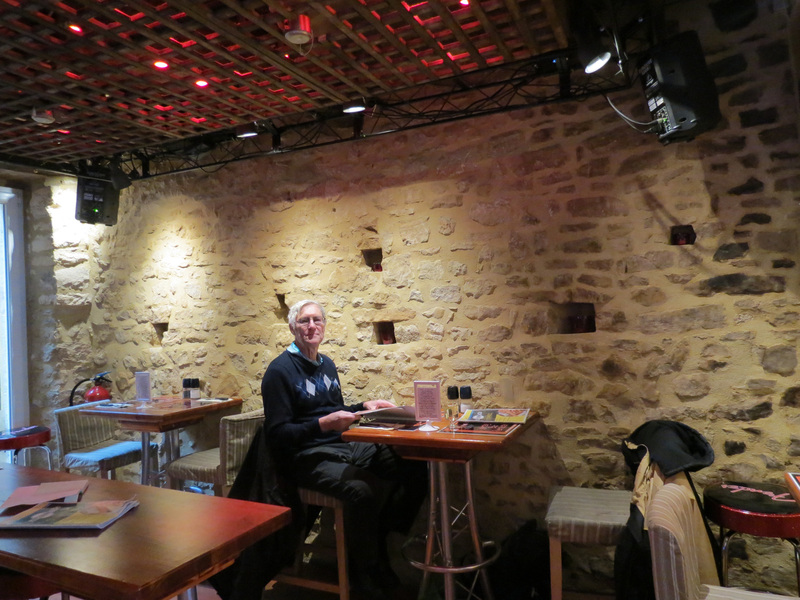 I sat downstairs, near the entrance and the bar, but there’s also a big room further in and more seating upstairs. 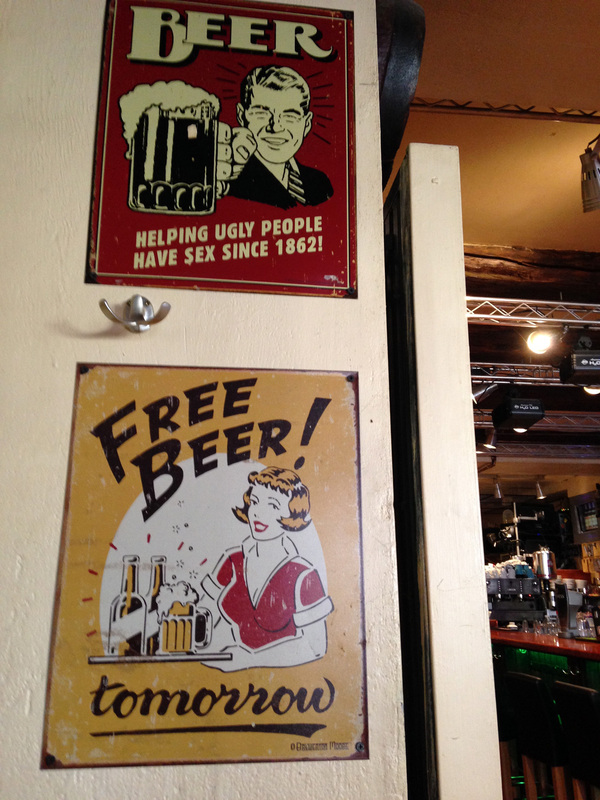 The décor downstairs is mainly reddish, with lots of old mirror tiles and plenty of old beer ads, some of them funny and/or a little “naughty”. It must be very popular, as groups large and small, old and young, wandered in and out all the time. Next to me were a single young man and a single older lady, both having the day’s special, so it seems that solo eaters feel comfortable here too. The service was prompt and friendly and my lunch salad was awesome. It was large and almost defeated me—which is highly unusual, as I love salad—but I did win! 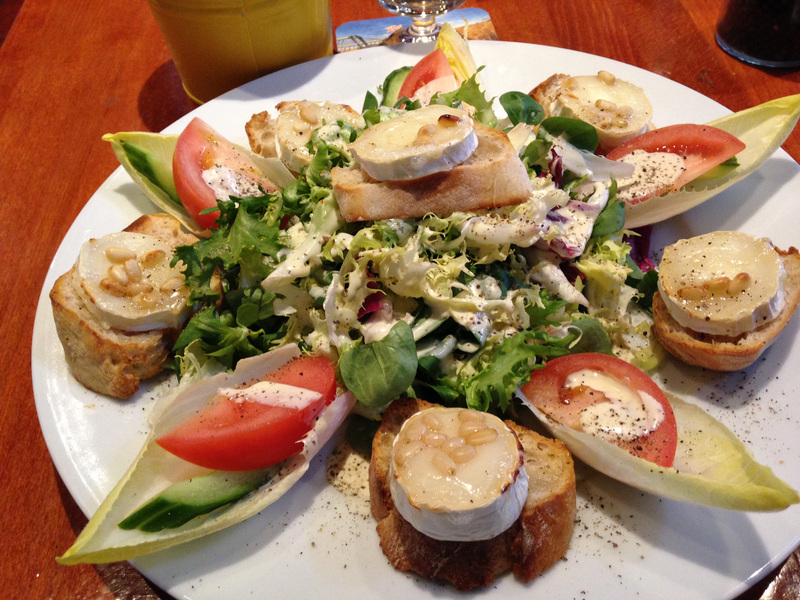 It was called Salade Madame Seguin, and was a bed of greens with chevre chaud (warm goat cheese) toasts, sprinkled with honey and pinenuts. It was beautifully presented and really delicious, so I’d already decided that it was worthy of another lunch. 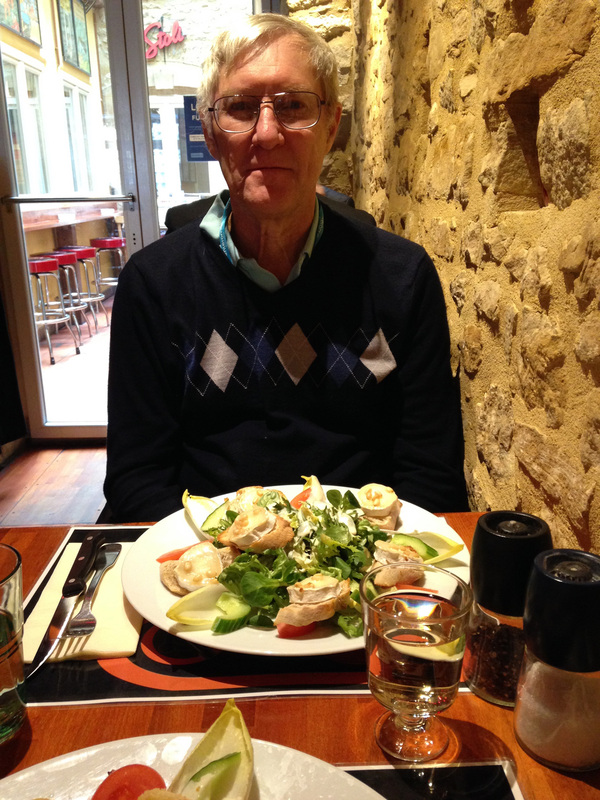 The huge salad only cost €12.90, and total with a glass of rivaner wine and an espresso was €17.80. Rod and I did come for lunch the next day and we sat upstairs. The color scheme is still basically red, but the theme is jazz music. The walls have some great posters of the history of jazz in tree form, plus pictures of jazz greats like Duke Ellington and Ray Charles, of old guitars, and even of Marilyn Monroe. It turns out they also have a DJ in the evenings and offer lively music. We did stop here early one evening too with a colleague for Erdinger beers and a kir, and it was a “happening place”, with people coming and going. 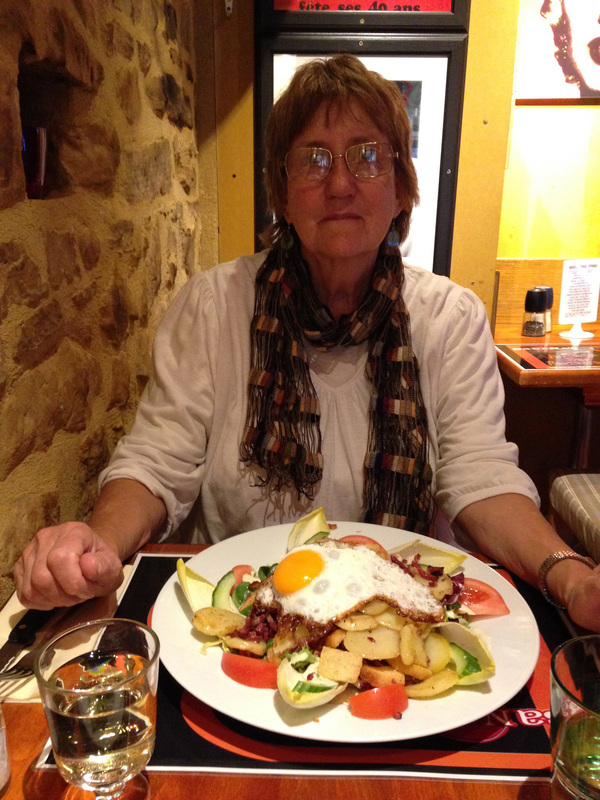 Anyway, that lunch Rod had the Salade Madame Seguin, which he pronounced ‘marvelous’, and I had the Salade Mere Denis (a bed of greens with potatoes, croutons, lardoons, and a fried egg on top). Pretty good, but I think I prefer the Seguin. 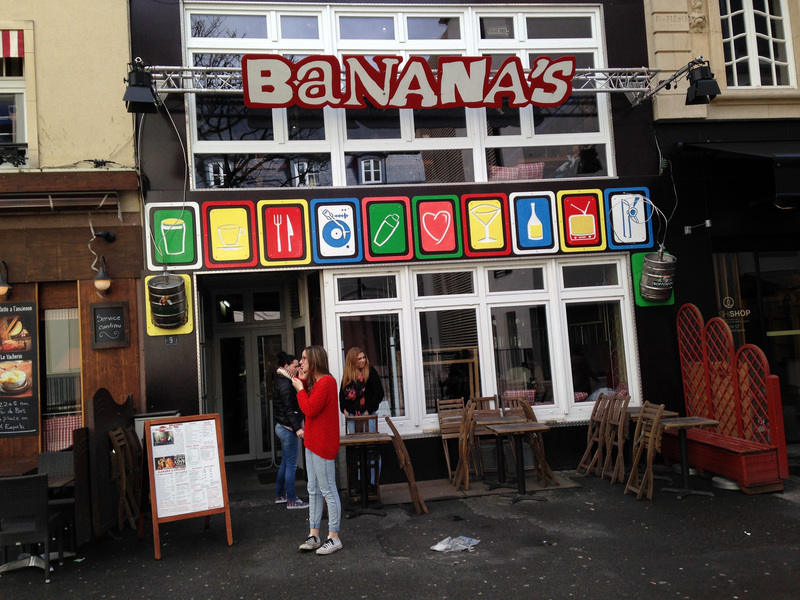 Definitely recommended if you are ever in Luxembourg City.